During the war in Vietnam, the United States mobilized a massive military force, created a puppet Government of the local troops in the new form of colonialisam. A huge war machine was set up to defeat the resistance of the people of Vietnam. Saigon - Cho Lon - Gia Dinh was the center of the US Army – the US local troops. In 1965, the US began pouring the American Expeditionary Force into South Vietnam, conducted the strategy of "the local war" with the sinister conspiracy of "the pacification" and "to search and to destroy" to dismantle all of our revolutionary forces. * Space 1: Simulating the time of special war from 1961 to 1964, it introduces the lives of the people in the new liberated areas, with the spirit of optimism, confidence, enthusiasm to participate into the revolutionary movement of the people of Cu Chi. 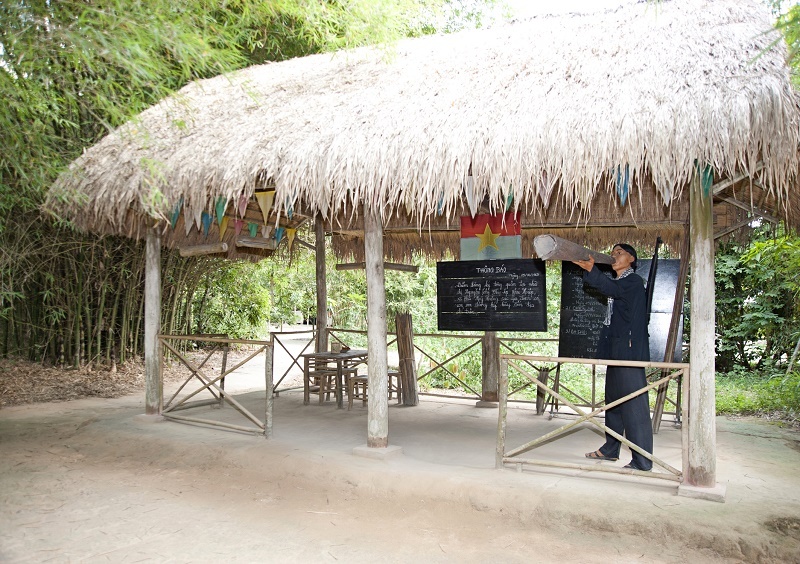 To this place, everyone will get a very real sense, as if they lived in the context of ancient life, with the images of the life, the fight, the work, the study of the people and the Comrades and the guerrillas in the liberated area of Cu Chi. * Space 2: Simulating the time of local war from 1965 to 1968, when the enemy fought and destroyed fiercely into Cu Chi liberated area. To here, we will see the ruined countryside and painful lives of the people in the war. All of lives of creatures were devastated by bombs, bullets, the houses, the temples were burnt and in ruin. And after that, people will be more impressed than ever before because of the undaunted spirit of the army and the people of Cu in the fight to defend our homeland with a spirit of optimism in the definite victory of the revolution. * Space 3: Simulating the empty area in Cu Chi from 1969 to 1972, reflecting the war to the top of the fierceness. 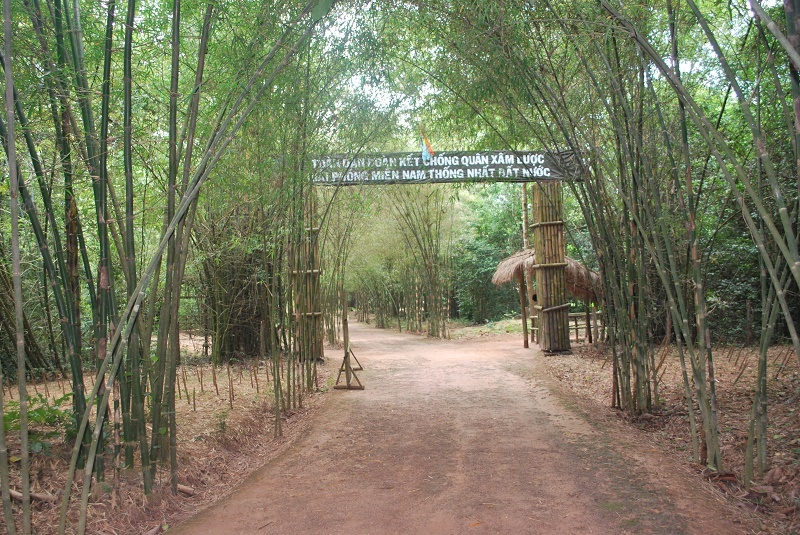 This place simulates the image of Cu Chi that became a liberated area that was under the free bombardments of the enemy. They threw down hundreds of tons of toxic chemicals, hundreds of thousands of tons of bombs and artilleries to devastate the land, to turn the place into a desolate land without houses, no doors, no lives of any creature ... There were .only bodies of the tanks, the planes and the bulldozers. The life and the activities of Cu Chi people, guerrilla and the armed forces were moved into the underground. Coming to the simulation Liberted area of Cu Chi, we do not .only understand the land that suffered a lot of losses and sacrifices in the war, but also understand the spirit of the patriotism, the deep hatred to the enemy of Cu Chi people. This place will contribute to the education of the young generationd about the responsibility of firmly defending Vietnam and building it to be a more and more prosperous homeland. On all the battlefields in South Vietnam, the movement of fighting the US army of the people and the army was increasingly developing that made the enemy embarrassed and get big losses. After the unexpected discovery of the enemy that our combat forces came from the earth and the trenches, they determined to destroy the tunnels, to repel our revolutionary forces away to create the safety belt for Saigon. Recognizing the strategic importance of the shield in the northwest of Saigon, in early 1967, after long study, the leading military experts of the US outlined a plan of the daring operation in the northwest that was named as Cedar Falls to the "iron triangle". That was a march of "Peeling the Shell of the Earth" to destroy the leadership Central Bureau of South Vietnam and Party Committee, the Regional Military Command of Saigon - Gia Dinh and our units. 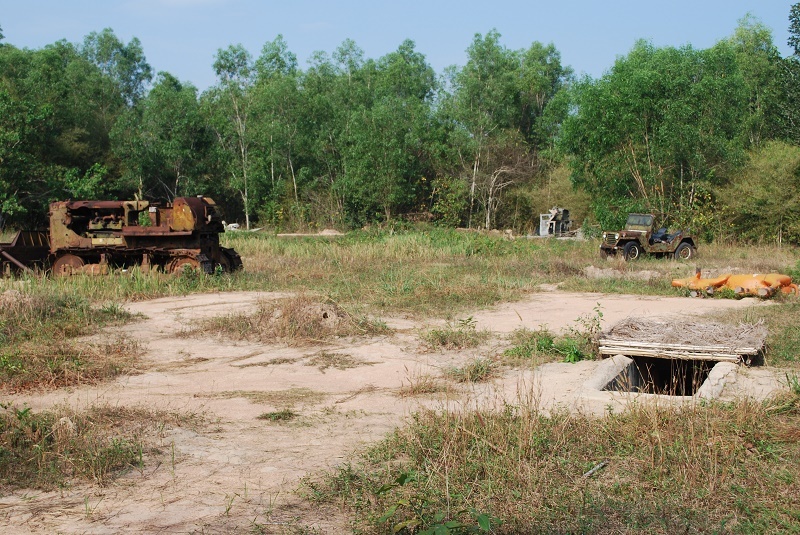 The enemy destroyed the base and Cu Chi Tunnels system by moving the people away, turning the region into a zone that was free for destruction. Like the Crimp march in early 1966, the Cedar Falls march was completely defeated after 19 days and nights in the "iron triangle", we saved the Party Committee, the Region Military Command and the main parts of the revolutionary base. To help visitors to feel somewhat the fierceness of the war and the resilent fighting strength of the military and the people of Cu Chi, in 2010, the mock-up of the fight to defeat the Cedar Falls operation of the US to the “Iron triangle” in 1967 was built in the Historic Memorials of Cu Chi Tunnels. The operation that are showed in the mock-up is considered to the most modern in Vietnam, with the collaboration of the sounds, the lights and the mechanic movements of the model and the harmonious layout of smoke, all these things give the tourists, the young generations of Vietnam the vivid moments as if they were immersed in the battle against the enemy. - .one Pillar Pagoda: Representing for the North. - Ngo Mon Hue: Representing for the Central. - Nha Rong Wharf: Representating for the South. 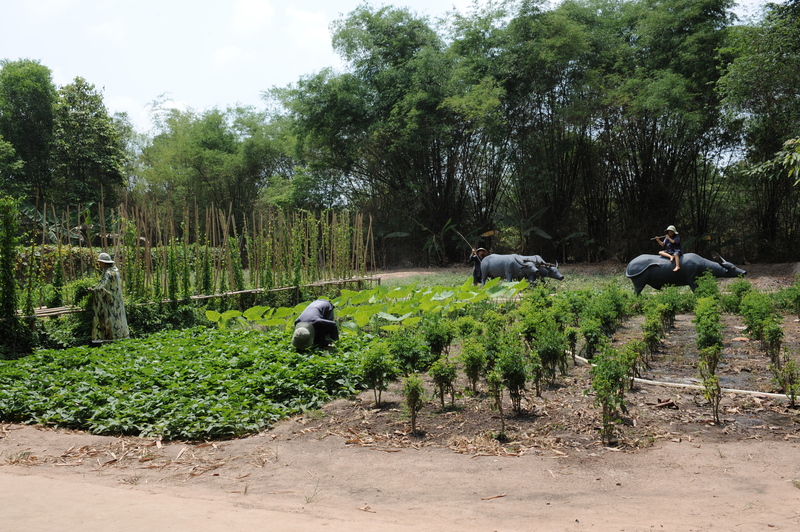 The three projects were inaugurated and put into operation .on 19/12/2009. This is a place for the people of Ho Chi Minh City and the southern provinces to visit the typical architectures, the world’s cultural heritages of the regions that combines with the sightseeing of the tunnels for the education of the patriotism for the young generations of Vietnam and offer incense to commemorate the heroic martyrs at Ben Duoc Memorial Temple for the martyrs. One Pillar Pagoda is located in the Dien Huu temple (that means long-term Blessing) in Thanh Bao, Quang Duc district, west of the Imperial Citadel of Thang Long in the Ly Dignasty, now it í in the .one Pillar Pagoda Street, Ba Dinh District, City Hanoi. 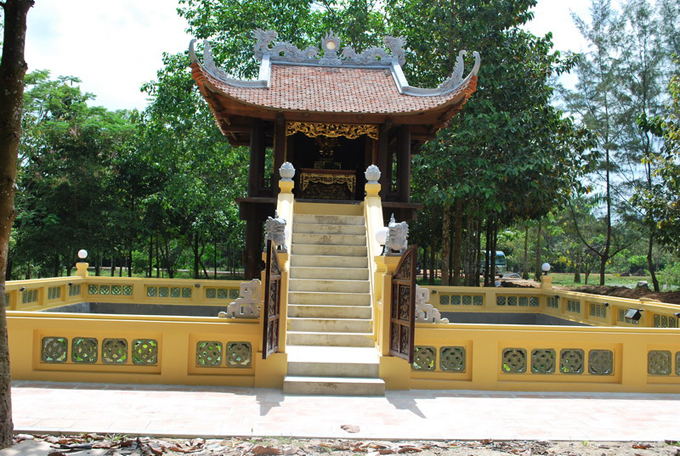 According to the General Vietnamese history, .one Pillar Pagoda was built in 1049, in the Ly Dignasty. 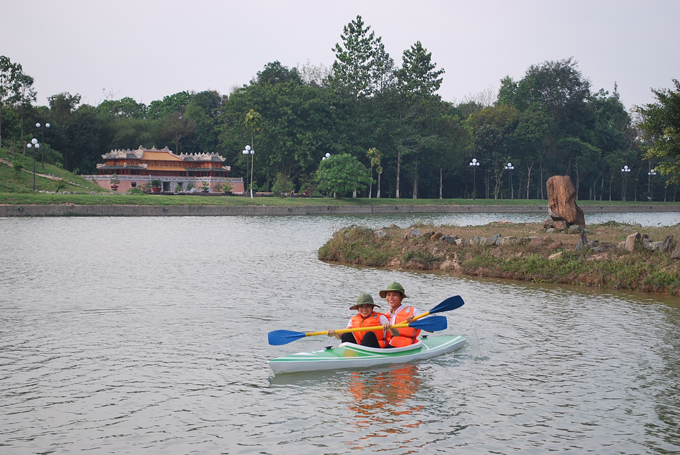 There are .only .one Hall in the pagoda that lies .on a rock pillar in the middle of the Linh Hieu lake that were planted many lotus flowers. According to the legend, the pogoda was built according to the dream of the King Ly Thai Tong (1028 - 1054) and as the suggested design of the Monk Thien Tue. In 1049, the King Ly Thai Tong dreamed of the Guanyin that was seating in the Buddha’s throne and led the King to the throne. When the King woke up, he told the dream to the mandarins, the Monk Thien Tue advised the King to build the pogoda, to build the rock pillar in the middle of the lake, to make the lotus throne of the Guanyin as he saw in his dream. The pogoda was finished with the pink thousand wings lotus throne that is the base for the Buddha, inside is the sparkling gold Buddha statue. The monks that came for the ceremony walked around the pogoda, prayed that the Buddha would bless the King a long life. Therefore, the pogoda was named Dien Huu pagoda. In term of architecture, the pogoda has the wooden texture with the Guanyin statue is inside for the worship. .one Pillar Pagoda includes the Lien Hoa Dai (Lotus Flower Hall) in the square form, each side is 3m length, with curve roof and was built .on a rock pillar that is 4m high with 1.2m diameter (not including the part in the land). It consists of two rocks that lap up closely together as a block. The upper stair of the pillar is the system of solid wood frames columns that are the frame for the throne above. Lien Hoa Dai was tiled with 4 bending corners roof and the two dragons flanking the Moon. The shape of the pogoda is as a lotus that is straightly reaching up from the square pond that are surrounded by the corridors made of blue enamelled tiles. Going around the pond in the small path paved with bricks, we will come to a staircase leading to the Buddha’s throne with a sign of Chinese letters: Lien Hoa Dai (Lotus Flower Hall) in front of the door. One Pillar Pagoda was under the repair many times. 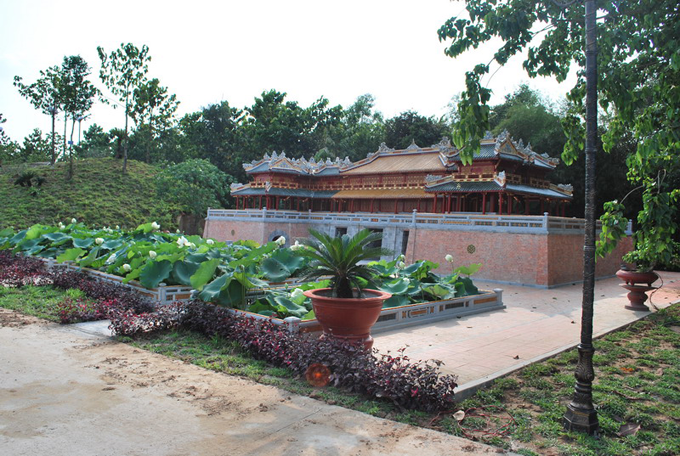 The big repair was conducted in the 18th year of Thien Ung Chinh Binh (1249). They almost had to rebeuild the pagoda. In 1954, before withdrawing from Hanoi, the French enemy set mine to demolish the pogoda. 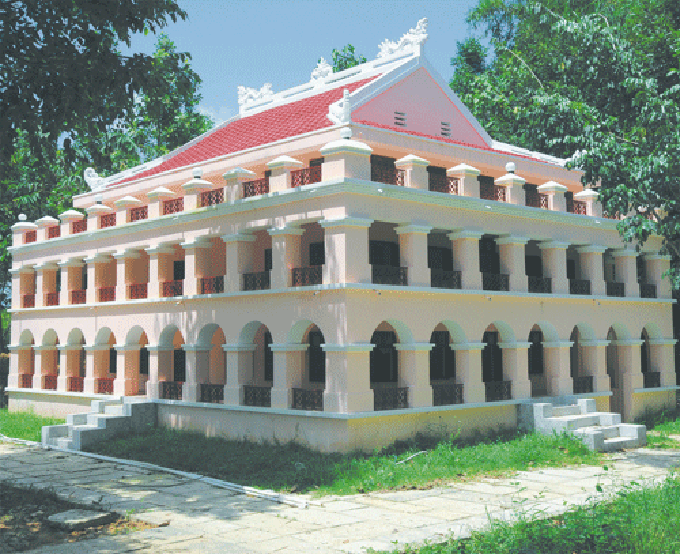 After the takeover of the capital, the Ministry of Culture had the .one Pillar Pogoda repaired in accordance to the old prototype that was kept from the Nguyen Dynasty. 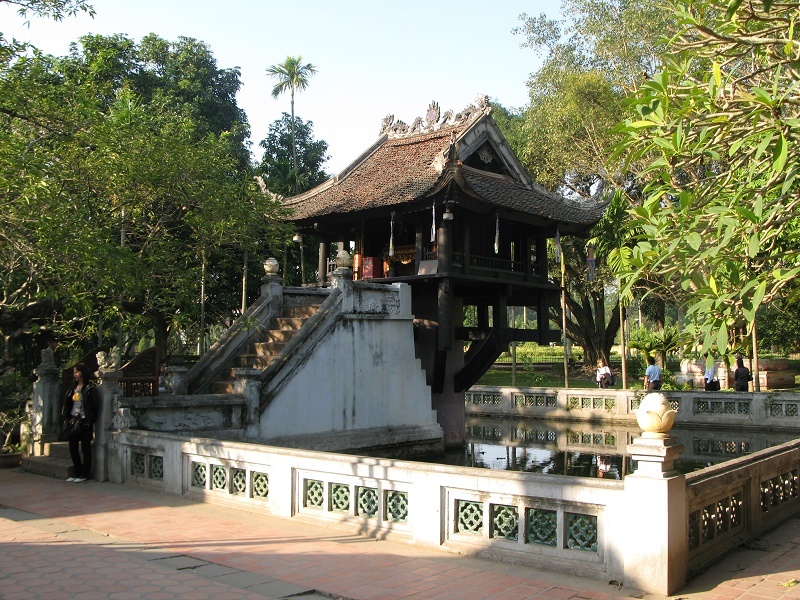 One Pillar Pagoda are associated with the history of the Hanoi Capital and .one Pillar Pagoda is also the symbol of the Thang Long land with thousand years of cultural objects for a long time. .one Pillar Pagoda was ranked as the relic of the history, the architecture and the art by the Ministry of Culture .on 18/04/1962. The miniature model of .one Pillar Pagoda in Cu Chi historic mmonumnet tunnels has the ratio of 9/10 compared with the main Pagoda in Hanoi. It was designed by Hanoi Institute of Architecture and constructed by the Joint Stock Company for the Construction of Cultural projects. Southern Gate is the architecrual heritage in the Nguyen Dynasty, it is the main gate in the South of Hoang Thanh (the Citadel).Ngo Mon was built in the 14th year of Minh Mang (1833) when the dynasty replanned the entire surface architecture of Hoang Thanh . The place of Ngo Mon today is the position of Nam Khuyet Dai (Nam Khuyet Hall) that was built in the first years of Gia Long. .on the Hall is the Can Nguyen Temple, there are two doors .on the two sides with the names of Ta Doan Mon and Huu Doan Mon. In the 14th year of Minh Mang (1833), Nam Khuyet Dai was completely domolished to give the space for the construction of Southern Gate. In the four gates of the Citadel, Ngo Mon is the largest gate. Ngo Mon means the gate that face toward the Horse direction. According to the concept of the geographical feng shui is the South East, this direction is the south. In fact, the direction of Ngo Mon Gate, as well as the entire Citadel of Hue is the direction of “Can”- “Ton” (northwest - southeast), but they are still considered as the Horse direction (south), the direction in which the Old Vietnamese learning regulated for the Kings to head towards the truth to rule the regime. In term of architecture, the Southern Gate consists of two main parts: the Hall – the gate and Ngu Phung Stair (Five Phoenix stair). * The Hall – the gate is perpendicular U-shaped, with the bottom length is 57,77m. The side is 27,06m. The Hall is made of bricks, rocks and combined with the copper-bearing beams. The hall is nearly 5m high, the area is over 1,560m2 (including the inside of the U shape). Theare are 5 ways to the Hall. The main way in the middle is the Southern Gate, just for the Kings. Two ways nearby are Ta Giap Mon and Huu Giap Mon, for civil mandarins and military mandarins and other members that serves the Kings. 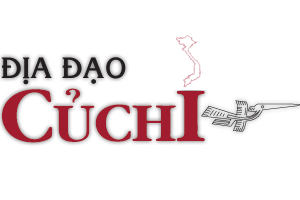 The two ways that are farthest in the two wings of the U shape are Ta Dich Mon and Huu Dich Mon that are for the soldiers and the horses and the elephants. The 5-port architecture style of "3 straight doors, two around doors" is so much alike the architecute of the visible is 3, in fact the inside is 5 of Ngo Mon in the Old Castle of Beijing. * Five Phoenix Stairs is located .on the Hall - gate Apart from the body of the hall, the stair is higher with a background that is 1,15m high that also runs along the U shape Hall. The stair consists of two floors, fully textured with the frame of 100 ironwood pillars. The interconnecting roofs of the downstairs run around to cover for the back corridor. The roof of the upstairs is divided into 9 sets, with lots of decorative image of phoenixes at the top edge; the side edges that make the stair look very gentle and serene. The middle set of the floor of Five Phoenix stair was tiled with yellow tube tiles, the remaining eight sets were tiled with blue tube tiles. A yellow stair, eight blue stairs, three straight doors, two around doors"
The architecture of the Southern Gate is similar with the Tiananmen Square in Beijing, but it clearly reflects the national architectural style. 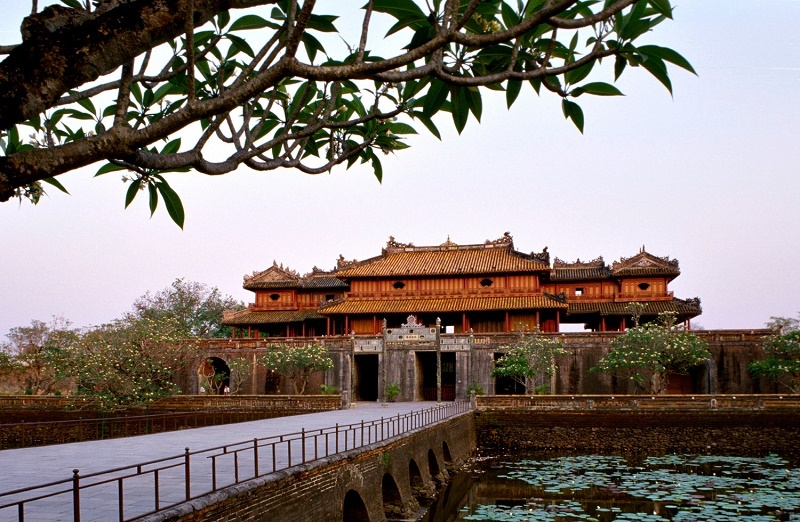 Southern Gate of Hue looks gentle, graceful and has traditionally been regarded as .one of the heights of the architectural art of Hue Citadel.Ngo Mon is the place that witnessed many important historical events. The most important festivals and ceremonies of the Nguyen Dynasty took place in hear like Ban Soc Ceremony (the ceremony of issuing the new calendar), Truyen Lo Ceremony (pronouncing the name of the new Doctor) ... .on 30/09/1945, the Southern Gate is the place witnessed the ceremony of the abdication of the King Bao Dai, the last King of Vietnam monarchy. The Relics of Hue Citadel was recognized by the UNESCO as the World’s Cultural Heritage .on the day 11/12/1993. 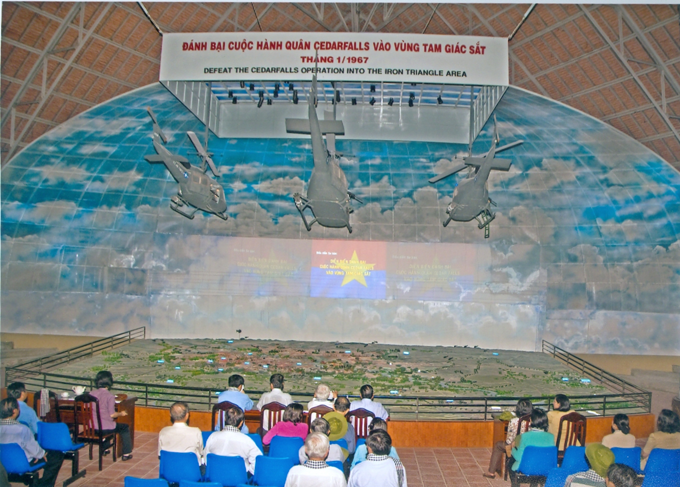 The Miniature MODEL of Ngo Mon in the Historic Memorials of Cu Chi Tunnels is equal to a quarter of the real .one. It was designed by the Centre for the Conservation of Hue Citadel, counstructed by the Central Company for renovations of the Monuments and Cultural Equipment - Central Branch. Before 30/04/1975, Nha Rong Wharf was the head quarter of The Empero Transport Corporation (Messageries Impériales) - .one of the first buildings that was built by the French colony after the capture of Saigon. The building was built from the middle of 1862 to the end of 1863, it was used as a place to sell ship tickets and the accommodation for the managers. The building has two dragons mounted .on the roof, in the type of "2 dragons flanking the moon", so it was often called as "Nha Rong” that means the Dragon House". Nha Rong Wharf remains in the people of Vietnam a sacred anniversary of great President Ho Chi Minh. 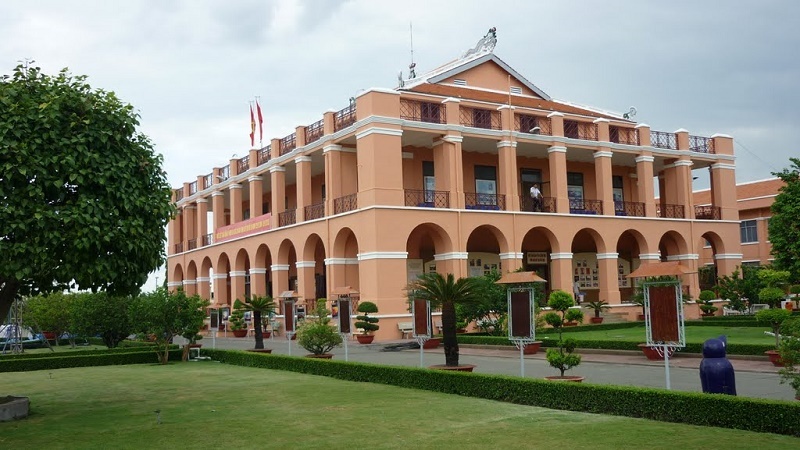 After leaving Duc Thanh school in Phan Thiet, Teacher Nguyen Tat Thanh applied to learn in the Technology school that trained the workers in Saigon. .on 05/06/1911, with the name of Van Ba, teacher Thanh worked as a chef .on the ship Admiral Latouche Trevilla to have the opportunity to come to Europe and abroad from Nha Rong Wharf to find a way for the national liberation. The current building remains the same architecture as the old .one. .on 09/7/1979, the People’s Committee of the City decided ta transfer the area of Nha Rong Wharf for the Department of Culture and Information City (now the Department of Culture, Sports and Tourism) to build the branh of the Area for the memorials of Uncle Ho. .on 30/10/1995, the People’s Committee of the City decided to officially change the name of "the Area for the Memorial of President Ho Chi Minh" into “Ho Chi Minh Museum – Ho Chi Minh City Branch”. It is a branch within the system of Museum sand memorial monuments of President Ho Chi Minh in Vietnam. Every year, this place attracts millions of domestic and international visitors to visit and learn about the historic memorials that attached to the youth of Great President Ho Chi Minh. There are many exhibiting photographs and documents about "The affection of Uncle Ho to the South and the affection of the people in the South to Uncle Ho" inside Nha Rong Wharf model.